Our product range includes a wide range of ek type multidisc clutches, stationery field multiple disc clutches and ekp type multidisc clutches. EK type clutches & brakes are used to control starting and stopping of machines. There are many designs in electromagnetic clutches & brakes, such as, single disc, multiple disc, stationary field, with slipring, dry wet etc. These are multiple disc oil immersed (magnetic flux passing through discs) type clutches with slipring. They are used specially in machine tools like milling, lathe, grinder, bearing machine etc. Dimensionally clutches and brakes are same. When slipring is not provided it is used as a brake. Plug type brush holder is required to supply current to clutches only. And brakes are provided with flying leads. No wear adjustment is required during working. After complete wear set of friction discs needs replacement. Standard voltage is '24 volts D.C. There are three types of mounting in every size. Basic Design : To mount on two shaft with key way or splines. 'B' Design : Bearing Mounted - To Mount on single shaft with gear or sprocket. .
'C' Type Design : Clutch is assembled on bush and cup is found free to couple with driven shaft. In all designs clutches and brakes consist of magnet body with sealed coil and internal and external discs, armature plate and cup. Internal plates and Armature plate are running with one shaft and external plates are running with another shaft. When D.C. supply is feeded to magnet body all plates are locked with each other and power is transmitted from one shaft to another shaft. 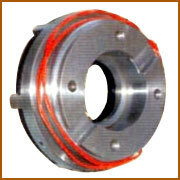 Electromagnetic clutches and brakes are widely used in all the Industries. M/s. MAGNA CORE is making almost all electromagnetic multi disc clutches & brakes required for the industrial purposes. Magnacore made type clutches are those which are used specially for following Purpose. Stationery field multiple clutches from Magnacore made type clutches. These models can be applicable in wet operation with alternative friction linings. The design is such that through the actuating pressure produced by the magnetic coil is indirectly transmitted to the plates by number of pins sliding through the coil. To achieve maximum torque and accurate operation, it is recommended to maintain air gap between the magnetic body and the armature plate. In these type of clutches air gap can be maintained periodically because the armature is fitted at the back side of magnetic body. These stationery field multiple disc clutches are widely used in all industries. Due to the elimination of brushes wear is automatically compensated. These clutches are secured against rotation by the locking lug. Six key ways are provided for locking of the stationery coil body. These clutches used in wet operation condition internal lubrication is to be arranged while the engagement of the clutch. General lubrication is to be considered necessary to ball bearings. Due to that lowest running temperature is normally possible in working of the clutch. 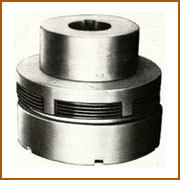 In many industries clutches are used to ensure smooth transmission of mechanical power. Conventional mechanical clutches create many problems in progressive automation of Industries. Electromagnetic clutches are designed to suit any automatic machines. Electrical operation of clutch makes possible push button control of a machine from one or several points & from near or remote plates. Electromagnetic Brakes stop the motor or machine Instantaneously or within desired time. 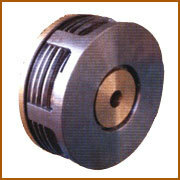 These clutches are used for smooth starting of machines. They are more used in machine tools as they are very compact in size. Besides machine toots they also have an application in various types of machines such as; Textile machinery, printing machines, plastic Machines, Multi speed gear boxes & various other machines. Eliminates wear & tear of starters & contact points. Motor need not take heavy current while starting as it starts, with no load condition. Low starting torque & less HP motors can be used. One motor can drive different mechanisms simultaneously or individually, through number of clutches. Rectifier unit where D.C.Voltage is not available. We also supply Spring loaded Carbon brush holder to supply power to the slipring of the clutch. Magnet body with plated coil. Internal & external plates of hardened steel. Armature plate is of low carbon steel & its outer dia is formed with threads & threaded ring is provided of the same for adjustment, of air Gaps. The cup is made of steel & its fingers are case hardened. Looking for “Multiple Disc Clutches”?